Blaine County voters on May 20 will be asked to support a two-year property-tax levy of up to $5.24 million per year to pay for county and city road maintenance. According to the county website, a property tax increase of $64.81 per $100,000 of taxable property value will be needed to raise the $5.24 million sought in each of the two years of the levy, based on 2013 valuations. By state law, half the money collected from city residents will be given to the cities where the money was raised; the other half will go to the county. The levy was prompted by an ever-tightening squeeze on county funding for road maintenance. Road and bridge maintenance was once funded partly by property taxes, but since the mid-1990s has been funded by state gas tax revenue and “mitigation fees” from subdivision developers. That policy was codified by a resolution passed by the county commissioners in 2007 prohibiting the use of general fund money for the Road and Bridge Department. But subdivision development has nearly ceased and the county’s annual share of gas taxes has fallen from $1.6 million in 2000 to $1.4 million today. The federal tax was set in 1994 at 18 cents per gallon for gasoline and 24 cents for diesel, and the state tax was set in 1996 at 25 cents per gallon. Legislation to raise the state tax was introduced this winter but not acted on. The county Road and Bridge Department has stated that the most cost-effective maintenance strategy is to keep roads at 10 to 13 years of remaining service life. Seventy-five percent of county roads are below that, meaning that the longer maintenance is deferred, the more it costs. The county’s figures state that roads in very good condition can be maintained at a cost of $1 to $2 per square yard, while those in poor condition cost $10 to $20 per square yard for heavy resurfacing. At the meeting Tuesday, county Operations Director Char Nelson told the commissioners that as remaining service life decreases, chip-sealing provides less additional life, and therefore has to be done more often. “We would be saving quite a bit of money by getting ahead of the game,” she said. The Road and Bridge Department has been running a maintenance-funding deficit of $300,000 to $500,000 annually, and its reserve will be depleted next year. Of the additional funds collected by the levy each year for fiscal 2015 and 2016, $3.5 million would go to the county and the remainder would be distributed among the cities in proportion to the amount collected within each city. 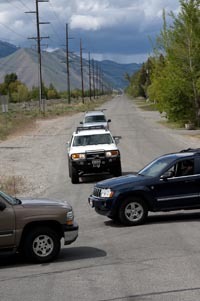 The levy is supported by four of the county’s cities but opposed by Sun Valley, which contends that the city’s high property values would require its citizens to pay an unfairly high portion of county road funding. Despite its opposition, Sun Valley would receive $651,181 annually from the levy proceeds. If the levy passes, Ketchum plans to hold public meetings to determine how best to spend the $795,580 that it would receive during each of the two years. Hailey would receive $228,465 annually. The city has stated that it has increased funding for street maintenance programs, but has done so at the expense of new bicycle and pedestrian infrastructure, expanding safe routes to school and ongoing road repairs. The city of Bellevue has stated that it would put its annual collection of $50,018 toward the east-west street rehab project, which will cost about $400,000. Carey would get $5,831 each year. It has stated that it needs funding to repair road shoulders, patch potholes and replace failing pavement, but has not determined specific projects. On its website, the county states that $1.67 million would be used on asphalt roads and $1.84 million on gravel roads and bridges. On Tuesday, the commissioners approved a 2015-2016 road maintenance plan based on an expectation that the levy will pass. Road Manager Tom Duffy said the plan is focused on preserving existing pavement rather than on rebuilding the roads. The plan includes crack sealing on about 45 miles of asphalt road during the two year period and chip-sealing on about 64 miles. That would cover about half the county’s 125-mile paved-road system. The plan also includes upgrades on 22 miles of gravel roads. A county travel plan drafted in 2012 states that about 100 miles of the county’s more than 300 miles of gravel roads need an upgrade. Duffy’s presentation showed numerous gravel roads that need drainage improvements to prevent spring flooding.